Well, it had to happen eventually. 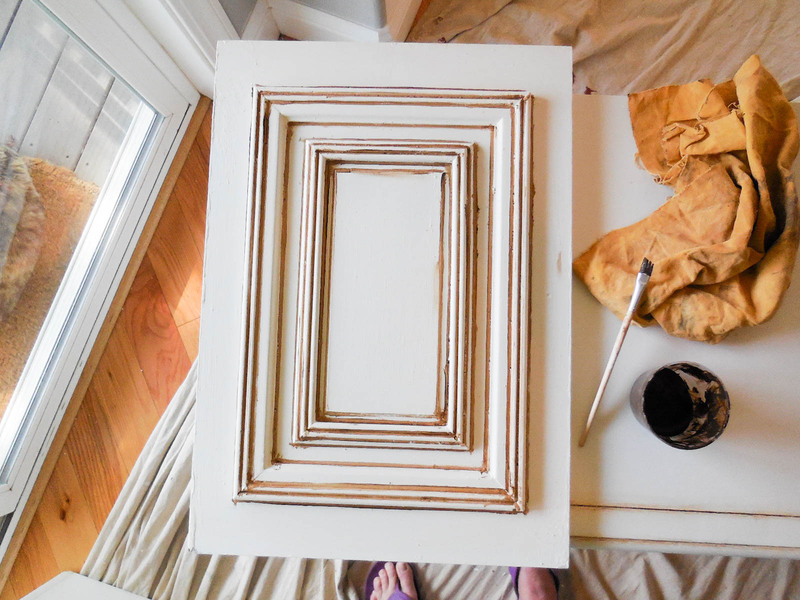 As a home and garden blogger, I am bound by the Blogger’s Code (cue ominous monk singing) to use chalk paint on something bigger than a picture frame. It also helped that I was getting really tired of my entertainment center. 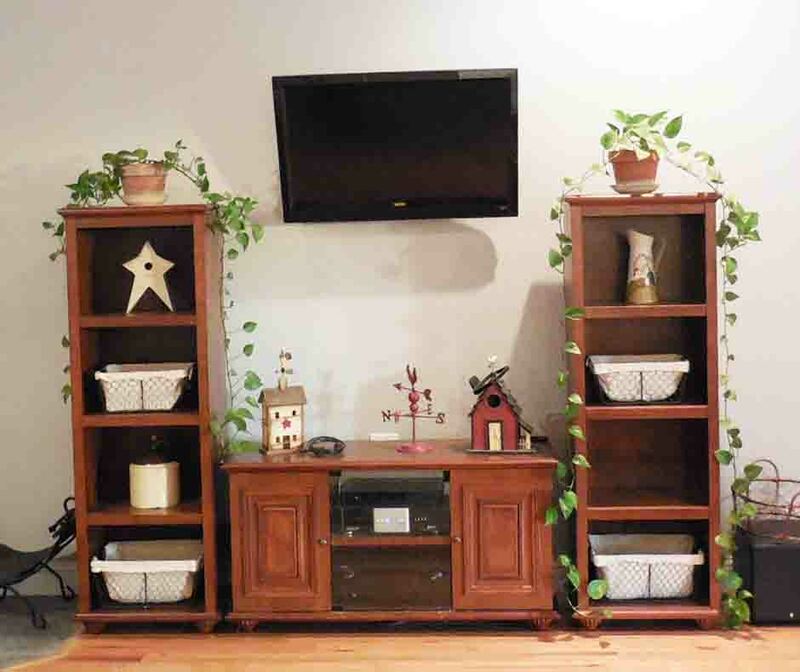 It was time for an entertainment center makeover! This is the picture of my entertainment center before: Now, I’m not saying it was absolutely horrible before… I mean, I did buy it this way, so this means that I really liked it at some point. But I tend to tire of furniture quickly, which is helpful for the blog, but not so much with my wallet. At least it’s very in to refinish your furniture instead of tossing it and buying new stuff. I should also mention that it is laminate wood, so though it looks okay in the picture, it was looking pretty rough in real life (and not in a used, distressed vintage sort of way… more of I ran into it with the vacuum cleaner and the cats peed on it sort of way). 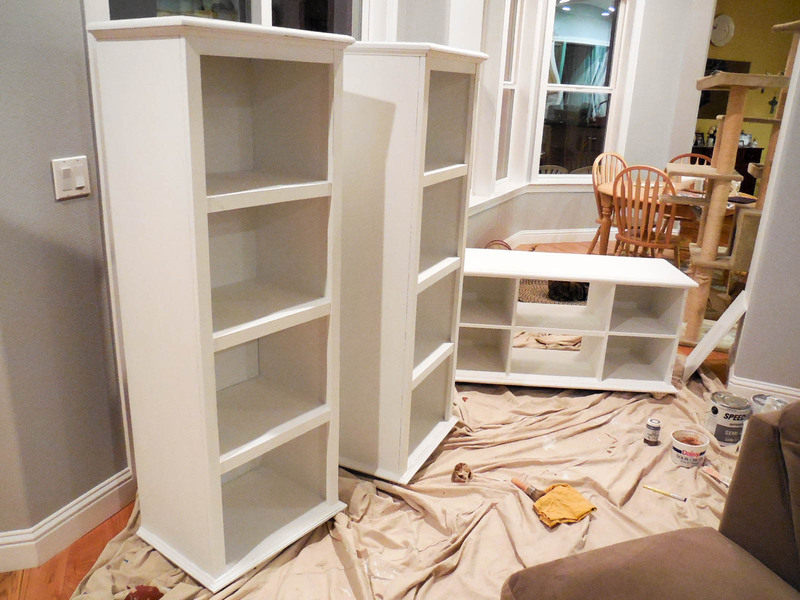 I also realized that I should have done the “before” pics right before I started painting it with all décor removed. The “after” pic just doesn’t have the same “wow” effect if it really didn’t look all that bad before. So from now on, I will store future furniture projects in my shop where I can shoot the before pics of said project covered in an inch of dust and surrounded by all my other crap for maximum effect. First, I removed the doors and all hardware. Then, I mixed the semi-gloss paint with the plaster of paris. The measurements above are a 3 to 1 ratio. I was ready to paint! What I wasn’t ready for is that it would take FIVE FREAKING COATS of paint to cover up the darker color and keep it bleeding through. Lesson learned: when covering a darker color with a much lighter paint, be prepared for a lot of painting! After the first coat, the plaster of paris started forming tiny clumps whereas there were none when I started. The only thing I can figure is I didn’t mix it well enough and left a clump of plaster on the bottom of the can which got mixed into the paint later. Because of this, I had to scrape the little clumps of paint off the entertainment center between each coat of paint. Did I mention I had to do five coats? And now I had to scrape everything down between coats? 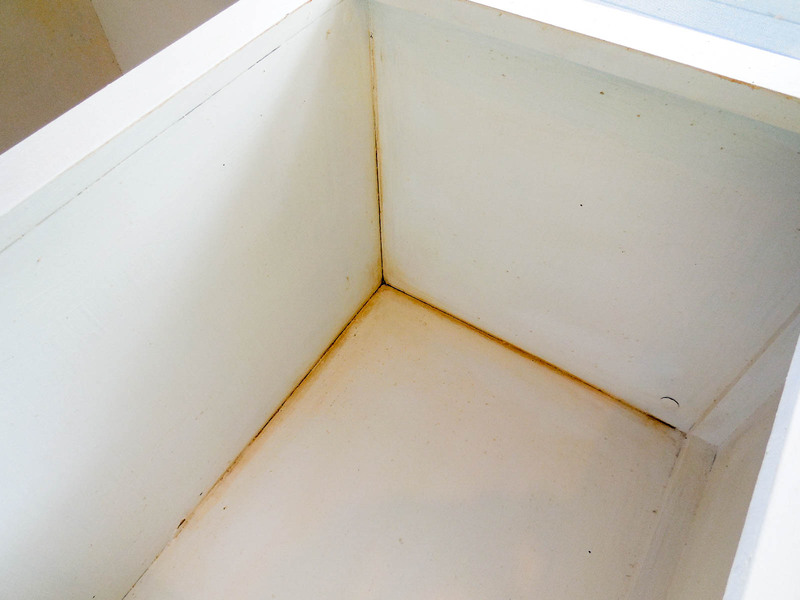 Lesson learned: when making homemade chalk paint, mix it really, really, really well. I blended using both the wax brush and the cloth as needed. Then came the fun part- distressing! And it really was a lot of fun to take out my frustrations after having to do all that painting and scraping! Needless to say, I got sawdust shavings everywhere. Lesson learned: don’t do this again in the house. That’s what the garage is for. Well, that and cars. All in all, it was a great learning experience, and despite the multiple coats of painting and scraping, it was a lot of fun to do and it turned out awesome! Which I’m really glad it did, because after all that work, it would have really sucked if it didn’t! Your paint job looks good. 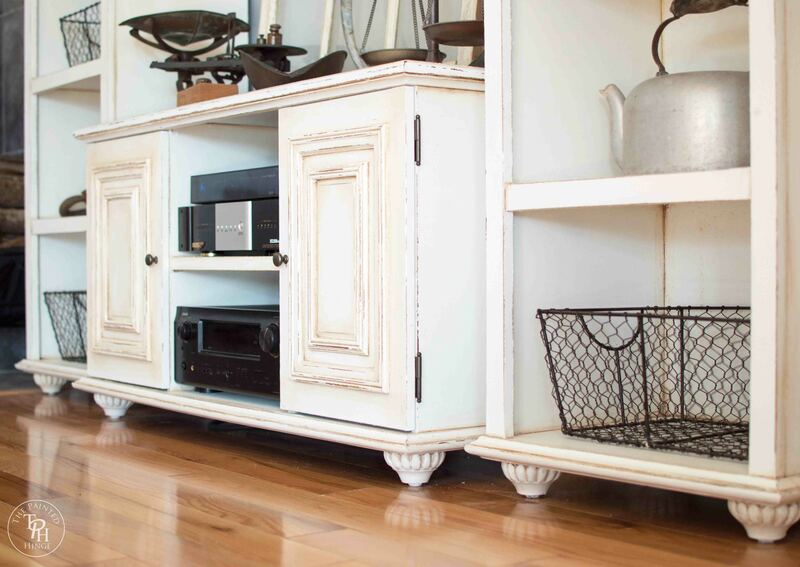 And you mixed your own chalk paint………….Wow! Thank you Jeanie! 🙂 I am cheap, so whenever I can save a buck or two- like mixing my own chalk paint- I will jump on it. My cheapness backfired on me this time because I bought cheap paint which resulted in having to apply multiple coats and my painting arm feeling like it got caught in a large vice grip. Michelle…you did an amazing job! We know that entrainment center is a beast to paint. Please link this up to our party Something To Talk About today. Great transformation! This looks so neat! I love the idea! Thank you Jess! Always a pleasure linking up with you. Have a wonderful week! This is amazing! The accessories on this are stunning, I love them. And I will say you are breaking the blogger code by talking about it! I have not tried chalkboard paint yet and feel really delayed and like I will get my bloggers member card revoked or something. Just stumbled onto your blog and can’t wait to read more! Hello Emily! Thank you so much for your kudos- most of the stuff you see on it is from my late grandfather. He was quite the “collector”- let’s just say he never passed up a yard sale. 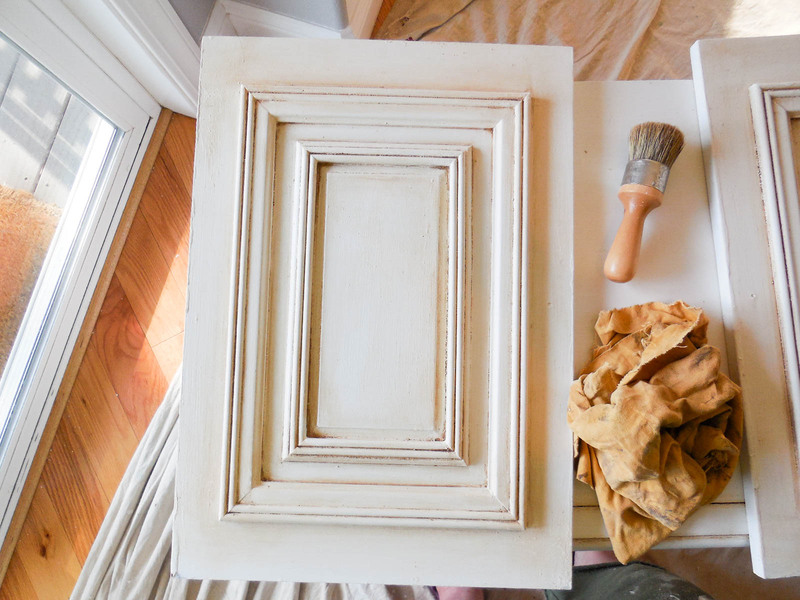 And fair warning, when you do get around to using chalk paint, you will be hooked! Welcome to my nuthou- er, blog! It’s gorgeous! Fantastic paint job, and I love all your cute vintage decor too! Thank you Christine! 🙂 I’m a sucker for old windows and put them anywhere I can. I love it, what a fabulous makeover. Can’t wait to feature you next week. Thanks for linking to Inspire Me. 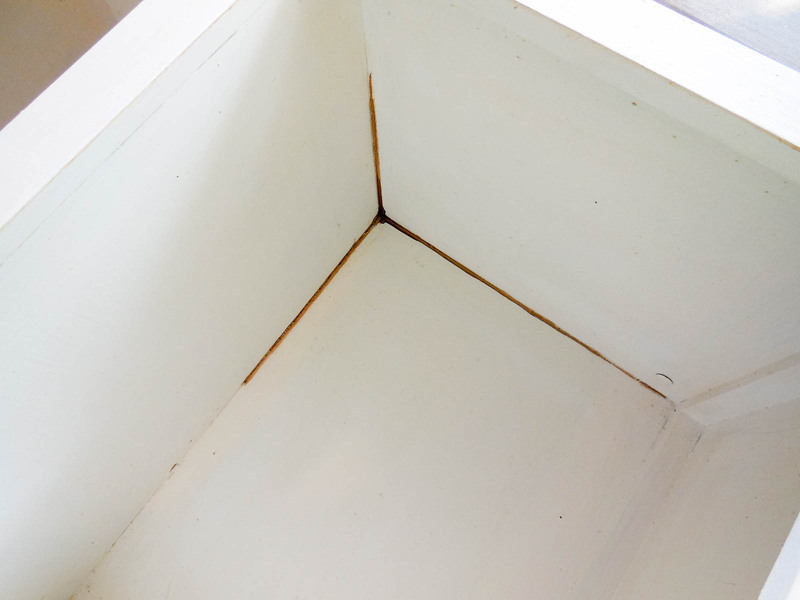 i have used chalk paint on my kitchen cabinets. It was Farmhouse Paint. I love the way the cabinets look. 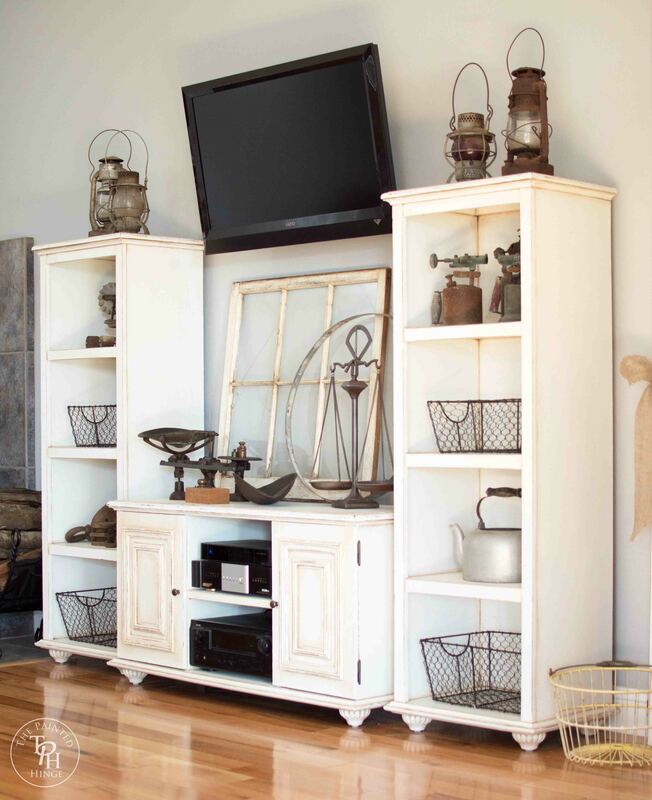 Farmhouse Paints don’t require any waxing. It isn’t cheap, however. I will be trying DIY chalk paint on my next project. 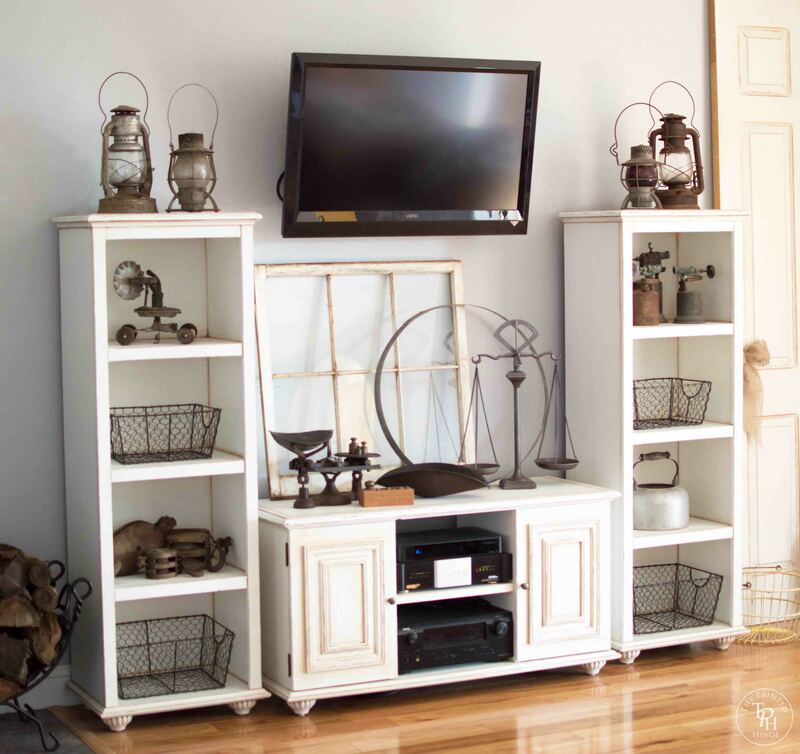 I really like the way your entertainment center looks! Wow…your hard work really paid off! I’ve never had to do 5 coats of paint before, but I’ve made my chalk paint with unsanded grout, and used Valspar paint from Lowes. 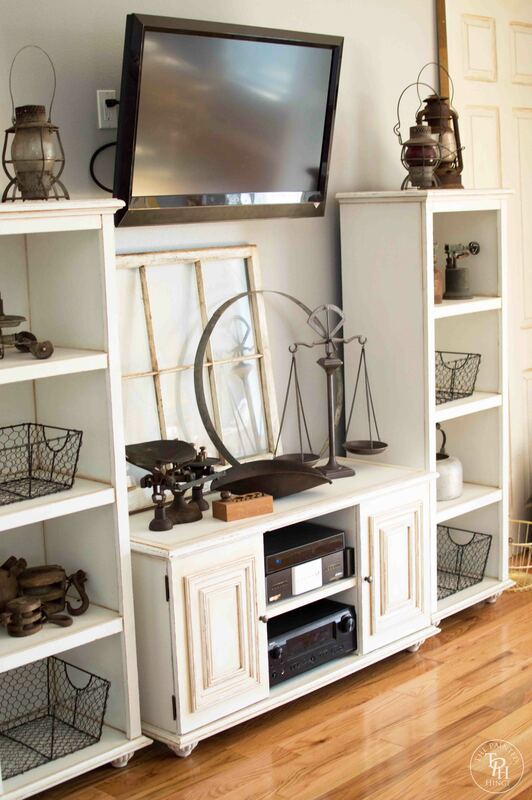 The entertainment center looks lovely! Thanks for sharing at Totally Terrific Tuesday! I hope to see you again tomorrow night. The party starts at 10pm! Thank you Christie! 🙂 And thank you so much for the tips… anything to avoid having to do 5 coats of paint again! My shoulder hasn’t been the same since! WOW!!! I love the transformation! The way you have everything perfectly placed, just beautiful! love love love the after!! !awesome makeover! Michelle, this is just gorgeous. 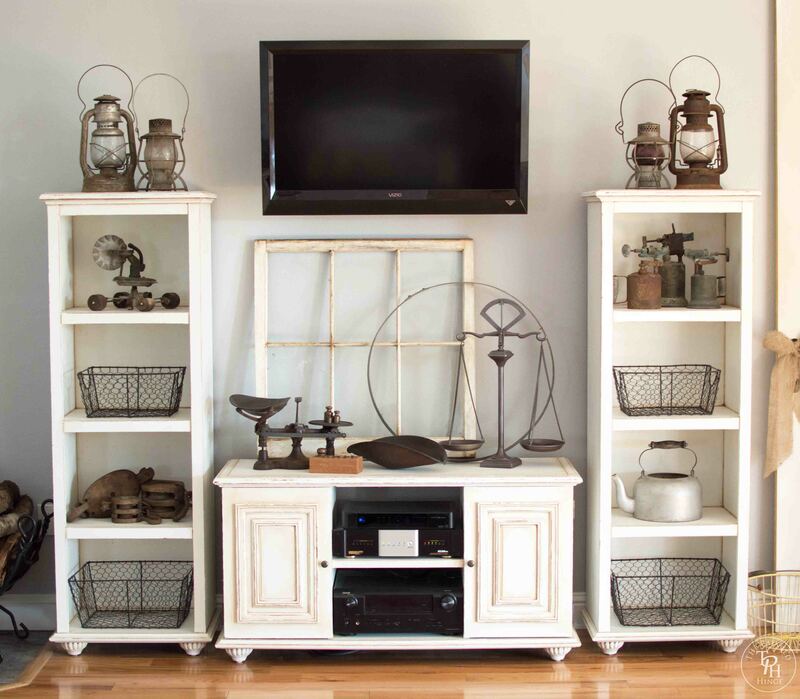 Your sense of decorating is amazing with all of the rustic antiques and wire baskets. I love it. Thank you for sharing at Inspire Me Wednesday. Featuring you in this week’s issue. Thank you so much Mel! 🙂 I’m flattered you’d choose my project over all the other wonderful ones in the link party. I’ll be sure to swing by and check it out! Hi Ann! 🙂 Thank you so much for sharing your experience with us! I bought some Calcium Carbonate for my next chalk paint batch and I can’t wait to try it out! Hey Michelle…i love reading your blog. Now i can chalk paint also! good news..valspar announces on their web site they have a new chalk paint . will be in Lowes and on shelves within next week or 2 …they also will be having the wax…clear and dark. this is good news as valspar is a good paint and this will be a good chalk paint. Thank you Laura! 🙂 I bought these a few years ago at JCPenney. I doubt if they still carry the exact same entertainment center, but they might carry something similar.